Immersive content that delivers an impactful experience is crucial to increased VR adoption. Virtual reality is poised to become a major trend with a potential to change almost every part of our lives – from the way we work and learn to how we play and relax. While we have seen disappointment around the sales of VR headsets, the technology has by no means been abandoned and continues to develop. Although it is still expensive for everyday consumers, virtual reality is rapidly changing the way people work in several industries. Stepping inside an immersive 3D environment, you can interact with colleagues around the world as if they were right next to you and hold virtual meetings that make it easy not only to identify who is speaking but also have a real-time feedback of how your ideas were received. Engineers and manufacturers increasingly utilise the technology to better collaborate on the design projects, and medical professionals employ VR to train doctors faster and less expensively. Salesforces use it to train for better customer-service interactions and even company retreats and team-building exercises can be hosted in virtual environments. This is just the beginning. With headset and software technology advancing, the global market is set to grow by 800% this year, and by 2021 the market for dedicated VR headsets is expected to be worth $7.7 billion. As the cost of the hardware will continue to come down in the coming years and the headsets and high-end PCs will become accessible to more people, the industry will need to address its key limitation in the limited availability of content for VR. This is already showing in the business setting where the initial set-up costs are small, while content production, particularly for bespoke training programmes, is highly valued. Compared to 2016, billings on VR projects grew more than 30-fold this year and yet finding qualified virtual reality developers still proves to be difficult. 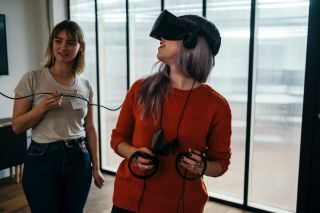 While the transition for content producers from gaming or film industry into virtual reality may appear straightforward, the truth is that to create high-quality content in the new medium, developers need to acquire a completely new set of skills. For example, the simple fact that there is no frame around the screen breaks almost every rule when making a film. With a headset on, we expect the virtual world around us to behave just as it does in real life. When we turn our head, we do not only need to see something else, but also expect a change in the way we hear sounds. This poses many challenges to content creators, who are entering virtual reality from other fields, where all the viewer needs is a flat screen in front of them. As we enter an immersive world, the way we navigate it also changes. Virtual reality games can encompass huge areas, meaning the developer needs to ensure the player never feels lost and use visual and audio clues as well as a range of other methods to guide the player down the correct path. Similarly, without keyboard, mouse and other game controllers, developers can no longer rely on ‘clicking menus’. These technological aspects of how the physical world in virtual reality needs to work to make the experience believable, have been studied since the modern concept of virtual reality was first proposed in 1969. It has been accelerated in the recent years with the development of several key technologies, such as low persistence displays, tracking technology, graphics and computer animation, and experienced content producers are now able to create virtual environments that mimic the physical world very closely. In the coming years, researchers and virtual reality developers will refocus on how to plausibly replicate the social world and interactions we experience in real life. Here lies another fundamental difference between virtual reality and film or games. Developers for virtual reality must be able to create a sense of presence, which has no equivalent in any other media. Finding ourselves in an immersive virtual environment we do not only need to see and hear the world around us in the same way we are used to in reality, but we also need to be acknowledged by the surroundings. Unlike a video game where the player is expected to ‘click’ on a character, in virtual reality the characters should respond to us based on our actions, even when these are not directed at them. Users of virtual reality are sharing the space with someone who is life size, meaning that body language works in a way it does not on a regular screen. Content developers must understand that if they aim to provide good quality experiences, virtual characters must acknowledge the presence of the user’s avatar. However, it would be wrong to think that 3D interaction is an unfamiliar territory where we have to define new rules. Instead, we need to think about how we do things in real life, after all we interact with the real world in 3D every day. Virtual reality should respect the social skills humans have developed and are accustomed to. Understanding this will ensure newly crafted content will live up to the potential of the technology and truly transfer users into new reality. We are already seeing that virtual reality expertise is an increasingly sought-after skill sets in the job market. Recent reports show that in the second quarter of 2017 the demand for online freelancers skilled in virtual reality grew far faster than for people with any other expertise. The challenge we are facing now is developing the talent, upskilling content producers and reskilling those who are curious to learn about virtual reality programming. Courses are available for individuals looking for an introduction to the subject and key skills in the field, and some are even suitable for people with no technical expertise. These are useful in teaching people everything from the basics – the hardware and the history of virtual reality – to different applications and the psychology of the technology. They even provide learners with step-by-step instructions on how to create their own game. Only with enough immersive content that delivers more impactful and enjoyable experience, will virtual reality be ready to make its long-awaited breakthrough into the mainstream. The key milestones in hardware developments have already been achieved, now is the time to focus on content to reach the promise of virtual reality to revolutionise our lives.